Outdoorsmen use glue. We like glue. Glue holds together the stuff we build and fixes the stuff we break. It binds flies, repairs broken tackle, mends tears in tents and waders, and prevents leaks in watercraft. In fact, I haven’t met an angler yet who doesn’t appreciate really good glue (come to think of it… good tape too). The problem though is there are a lot of different glues and adhesives out there, and selecting the right one for a specific job can be confusing. 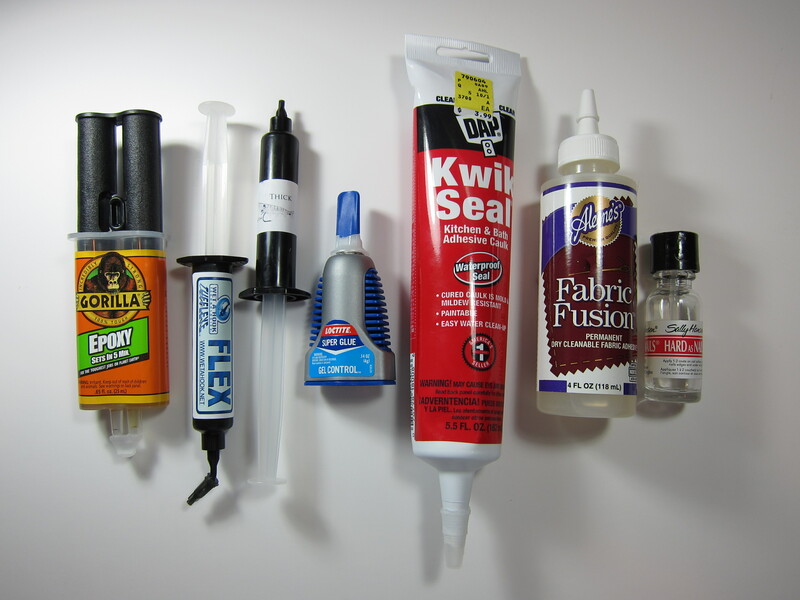 So this month, let’s take a closer look at a few proven glues and when/where you should use them. Epoxies are 2-part resins that, when mixed together, “cure.” Unlike conventional adhesives that harden through a process of evaporation, epoxies undergo a catalytic reaction causing the 2 mixed resins to harden. This reaction occurs over a manner of minutes and produces heat as a byproduct. Epoxies form a very hard, almost glass-like bond. Because no evaporation of solvents occurs as epoxies cure, the start-to-finish volume of epoxy does not shrink. Epoxies are suitable for use as protective coatings on the bodies and heads of flies and are often used on spoonflies. Epoxies are also good for gluing ferrules together, repairing tackle and general construction where a strong, rigid, gap-filling bond is required. There are a variety of epoxies on the market. The most common are those labeled as “5-minute” and “2-ton.” The 5-minute epoxies catalyze quickly and have a working time of around 3-4 minutes, while the 2-ton epoxies allow for a working time of approximately 15 minutes and form a more durable bond. Most epoxies will yellow quickly from exposure to UV light and although cured epoxy is glassy-hard, it’s brittle and can crack or break under impact. Uncured epoxy resins are hazardous so users should follow the manufacturer’s instructions carefully when using them. Widely available brands include Devcon, Gorilla, and Loctite. Light-Activated Resins have been used in dentistry and other industries for many years. They have recently become available to the public for use as specialty adhesives. Light-activated resins are applied to a surface (such as a fly or tackle component) and cured by exposure to intense rays emitted by a special flashlight. The intense light catalyzes the resins, curing them in approximately 15-20 seconds. Light-activated resins are available in both thick and thin viscosities and are applied with either a syringe or a small brush. Cured finishes range from flexible to hard. They do not yellow over time and are resistant to degradation by water, fuels, and solvents. These resins have become extremely popular with fly tyers because their rapid cure times make it possible to quickly and cleanly build fly parts and patterns with exceedingly durable finishes. Two of the most widely used brands are Tuffleye and Clear Cure Goo. Users of light-activated resins should follow the manufacturer’s instructions carefully and avoid directly exposing their eyes to the powerful light and their skin/eyes to the uncured resins. Cyanoacrylate (CA) adhesives have been around for many years. These are commonly known as superglues. They will instantly bond together a wide variety of materials (including fingers) and are often used in fly tying to attach eyes and secure thread and materials to the hook shank. CA adhesives are also used to repair fly lines, secure knots in leaders, and other misc. applications where an instant ready-to-go bond is required. The gel CA adhesives are perhaps the most user-friendly and easy to work with. Cured CA adhesive is fairly strong, but will become yellow and chalky quickly after exposure to light and water. The fumes from CA adhesives are toxic, and some users (including yours truly) are allergic to them. If you plan to use these adhesives be extremely careful not to get them on your skin. Also, use very good ventilation to avoid respiratory complications. Due to my personal experience with CA adhesives, I am hesitant to recommend them, but they are widely popular and highly useful for a few applications. The most common brands are Loctite and Zap-a-Gap. Dap Kwik Seal is a clear, flexible, waterproof bathroom caulking/adhesive that forms a very strong, flexible, almost indestructible bond. The texture of Kwik Seal is similar to standard caulking (paste-like) and it can be a little difficult to work with, but the results are very good. I have used Kwik Seal to coat the heads of flies, form waterproof gaskets around kayak fasteners and accessories, and to repair waders and camping gear. It is good stuff. Kwik Seal requires 36 hours to cure and will become milky and weak if exposed to moisture sooner than 36 hours after application. Kwik Seal comes out of the tube white and becomes clear as it cures. It also shrinks slightly as it cures. Although many-a-tile setter has applied Kwik Seal by bare hand, it contains ethylene glycol and formaldehyde. DAP recommends using gloves and adequate ventilation with this product. Kwik Seal is available in most hardware and department stores. Aleene’s Fabric Fusion (AFF) is one of the best adhesive products I have come across in a long time. This non-toxic water-based adhesive has a syrupy texture when wet and a finished appearance similar to cured epoxy. Once it completely dries (72 hours), AFF forms a very strong, durable, clear, waterproof bond. Although AFF shrinks substantially as it dries, it is an alternative for fly tying applications that typically required epoxy. AFF cleans up with water and because it is non-toxic it’s safe for kids to use. I have used AFF as a protective coating on spoonflies and Deceivers, as a body-builder for Surf Candies, and as a clear-coat for shrimp and baitfish eyes. It also makes a great adhesive coating for thread wraps and barbell eyes and can be used to repair luggage and clothing. Aleene’s Fabric Fusion is available in a 4-oz. squeeze bottle for broad applications or a small squeeze pen for fine applications. It is sold in most craft and department stores. No article on glues would be complete without mentioning Sally Hansen’s Hard-as-Nails (even though it technically is a lacquer). This ubiquitous nail polish product with a familiar acetone aroma has been used by fly tyers for everything from head cement to clear coat. Hard-as-Nails dries quickly to a wonderfully reliable crystal clear finish and is perfect for coating thread wraps or polishing epoxy patterns. I have used Hard-as-Nails to secure materials on flies, freshen up old lures, coat fly line end-loops, and for a variety of other applications where a quick strong clear coat is required. Hard-as-Nails is available in small 4.5 oz. bottles red/white bottles in nearly all grocery stores, department stores, and pharmacies. If you can’t find it there, just swipe some from your spouses’ makeup bag! This is a very good article on glues. Because of you, I am now turned on to fabric fusion. It takes a while to dry and it works great. I also like the tulip glitter. Good stuff, but well worth the wait. I have almost glued my fingers together with super glue. I don’t like the fumes. I need to make sure my area is well ventilated. I am a big fan of sally hansen’s. Thanks for the great article. I’ve been using Hard as Nails clear as head cement for years. The product doesn’t dry up in the bottle from un-use and even has the handy built in applicator brush. Thanks for your articles. Well written. Glad you liked the article. That built-in brush is definitely handy. I’ve found that cutting the brush at an angle helps to apply the Sally’s to small areas (like the head on a small nymph or midge) while still allowing one to apply large quantities, as when coating a spoonfly.